With advancing age come problems of unsteadiness and dizziness. Researchers are looking for ways to stop the falls. 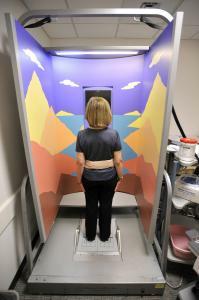 A patient tests a balance belt that has sensors to alert her when she’s in danger of falling. Linda Victor is what some doctors call a perfect patient - perfect because the balance problems that crept up on Victor over the past few years vividly illustrate the typical hurdles many older adults face in maintaining their stability. Victor, a 70-year-old Lexington resident, used to love to walk. But that enthusiasm dried up after one serious fall while commuting to work six years ago was followed by another during a lunch break. Left in their wake is a general feeling of unsteadiness, especially while walking outside on uneven surfaces. At any given time, an estimated 6.2 million Americans report a chronic problem of balance, dizziness or both, according to federal data. The problem tends to increase with age, and with the aging population, specialists say the ranks of the unsteady are sure to grow. The looming numbers of balance-challenged elders have inspired researchers in Massachusetts and Oregon to develop two different styles of belts that will either vibrate or beep and alert the wearer that he or she is tilting to one side and may potentially fall. The belts are expected to be marketed next year, initially to physical therapists who work with people with balance problems. A person’s sense of balance relies on an exquisite interplay of three regions, your vision, a maze-like structure in the inner ear which includes microscopic cells that resemble little hairs, and the muscles and joints running from your feet, up through your spine, that sense your body’s position. All three areas send signals to your brain, which processes the information, and helps give you a sense of spatial orientation - your balance. As we age, eyesight fades, as do our muscles’ ability to sense surroundings. Meanwhile, the hair cells in the inner ear die off and do not regenerate. These declines combine to throw off the signals to your brain about your balance. Victor only recently realized that the combination of advancing arthritis in her ankles, knees, and hips, and her gradual hearing loss, were likely related to her balance problems. Specialists believe hearing loss mirrors the degeneration of inner ear hair cells. “All these things I took as separate issues,’’ she said. In addition to an aging balance system, elders - for reasons that are not entirely clear - also are more likely to be plagued by certain disorders that can cause dizziness. The most common is Benign paroxysmal positional vertigo, or BPPV, which causes vertigo, and dizziness due to small calcium carbonate crystals (sometimes referred to as “ear rocks’’) that collect within a part of the inner ear. The displaced crystals shift during head movements, sending false signals to the brain. Often, a combination of balance and dizziness disorders can make it challenging for specialists to pinpoint the source of a problem. “We can’t get inside a patient’s head and feel their symptoms, so we are at the mercy of their descriptive skills,’’ said Dr. Steven D. Rauch, an ear, nose, and throat specialist at Mass. Eye and Ear. The first flavor, he said, is characterized by a sense of blacking out while standing up. It can be caused by low blood pressure, dehydration, and abnormal heart rhythms, but typically not an inner ear problem, Rauch said. The second is unsteadiness, often a result of an inner ear disorder but also potentially caused by a stroke or a neurological problem. The third is more classic vertigo, a feeling that the world is spinning around you. It can be caused by migraines, stroke, even epilepsy but is most often traced to an inner ear problem, Rauch said. And the fourth is lightheadedness, similar to the feeling of taking too much cold medicine and usually traced to a panic attack or anxiety, he said. Treatment for balance problems can vary greatly once the “flavor’’ of the problem is pinpointed, Rauch said, and can include physical therapy or a change in medications, such as blood pressure medicines, that may be contributing to the dizziness. One of Rauch’s colleagues, Conrad Wall III, has developed a “balance belt’’ that is designed to help patients whose flavor of dizziness stems from an inability to sense when they are about to fall over. Wall, director of the Jenks Vestibular Diagnostic Laboratory at Mass Eye and Ear, said his two-pound, elastic belt equipped with motion sensors that trigger a vibration similar to a cellphone when the wearer starts to tilt, was able to reduce from 80 percent to 20 percent the risk of falls among a group of elders, average age of 79, who were trained to walk with the device. He used data from other researchers who found that elders had an 80 percent chance of falling at least once a year, then he measured the number of falls among seniors trained to walk with his belt. Wall, who is principal scientist of a company he founded to market the belts, said the devices will be available in about a year for physical therapists, who would use them on patients in the clinic, then have patients take one home for more practice between sessions. “It will record whether they are cheating and not doing their exercises,’’ said Wall, a biomechanical engineer who has spent a career testing dizzy patients. “Those belts will help us work out the bugs for a consumer model that could be worn all the time,’’ he said. Fay Horak, a physical therapist and professor of neurology at Oregon Health & Science University, also has developed a belt that will emit various tones to signal whether the wearer is tilting left, right, forward or backward and is in danger of falling. Horak has received a number of federal grants to research methods that have improved therapy for patients with dizziness and balance problems. She said too often people who have struggled with these problems become reclusive and inactive because they fear they will fall. The habituation therapy that she specializes in to get people back on track may seem counterintuitive. “You have people go through head motions that make them dizzy and the brain will learn to suppress that dizziness,’’ Horak said. For patients who have serious problems with balance because of substantial damage in their inner ear - often from medications such as certain antibiotics - therapy can teach them how to rely more on the other areas of their body that support balance - their vision and their muscles, Horak said. “We have people who are living longer,’’ she said. Kay Lazar can be reached at klazar@globe.com. Follow her on Twitter @GlobeKayLazar.